The Hour of Code is a global initiative to introduce young people (and those young at heart) to computer science. The Hour of Code takes place during Computer Science Education Week, which is held annually around the birthday of Admiral Grace Murray Hopper (December 9, 1906). For teachers who are already leading robotics courses and programs, the Hour of Code might seem redundant. But consider students who have not opted into optional robotics courses. This is an opportunity to expose all students to robotics. This is particularly important if the opt-in robotics program at your school has not attracted a large number of girls or other under-represented groups. Robotics is one of the best ways to introduce people to programming because of the immediate feedback and the attractiveness of the medium, LEGO blocks, and other building materials. So, what can you do in an hour? First, of course, you don’t have to limit the initiative to an hour (and you don’t have to schedule it during Computer Science Education Week). Second, given the cost and availability of robotics kits, some activities use virtual robotics, robots on computer and tablet screens. 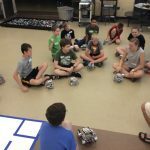 Below are a variety of resources and examples that might inspire you to share robotics with a wider audience during an Hour of Code. Direct from the Hour of Code organisation, this page links to several pages using a variety of robotics kits and virtual robots, including LEGO WeDo and Mindstorms EV3. Thinkfun has a virtual Robot Repair activity on this page. A lesson plan is also available. A similar activity is offered by Class 42, for an older group of students. 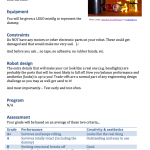 Lightbot is another virtual robot for a younger group. Robot Mesh includes virtual VEX robots that can be programmed online, with a teacher guide. Wonder Workshop, makers of the Dash, Dot and Cue robots, have two years of Hour of Code activities. Jackie Child’s school completed their 2018 Hour of Code activities early. 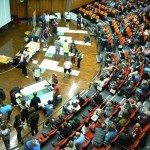 The school organised competitions for each grade, year 1 to 5, using Blue Bots, Pro Bots, Spheros, Mambo Drones and, of course, Lego EV3s. Jackie documented the event and also linked to activities from previous years. Tynker is a programming app that can be used to code the LEGO WeDo 2.0 and other robots. There is a wide range of online activities for Hour of Code available for Tynker. What if you don’t have access to robots or computers? Thinkersmith’s Unplugged Hour of Code activity (with a lesson plan and video) shows students that writing directions (otherwise known as coding) is not limited to machines.